Something changed fundamentally right in the heart of Amsterdam yet you hardly see it. For centuries, a central part of town was inaccessible to civilians. The Dutch marine ruled here ever since its days of global dominance. But budget cuts force the seafaring military to retreat and open up an historical part of town to the public. Together, marine and municipality aim to make this a gradual process which should turn this terrain into a valuable Amsterdam asset. As more often, artists and start-ups are lured to this part of town in order to achieve this. But the first attractive hangouts offering food and drink have already sailed in too. Pension Homeland is among those pioneers exploring the possibilities of this new part of Amsterdam. In a curious cubicle that used to house the marine officers, it combines a hotel, a restaurant and, last but not least, a brewery. The latter is a small-scale affair. 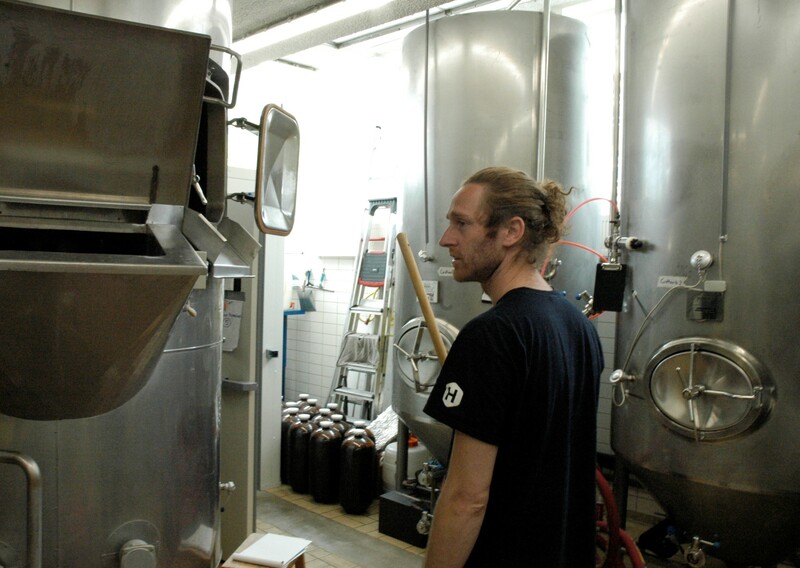 Brew master Erik Spratte is still fine-tuning the second-hand 1000 litre installation brought over from Germany. He works right alongside the cooks of the restaurant, just a big glass wall between them and his brewery. It adds to the dynamic vibe that already surrounds this place. It bit like our very own breweries, yet smaller. At this bustling strip of activity, Erik currently brews two Homeland beers. Right after it opened, Homeland started to pour its British style pale ale. An amber coloured, grainy and not overly hoppy brew. They recently introduced Erik’s second, a beer brewed with significant amounts of spelt, which give this one its full, creamy mouthfeel. Part of the production is bottled, a painstaking process resulting in just about one full bottle a minute. Those hard-earned bottles are distributed among affiliated enterprises. 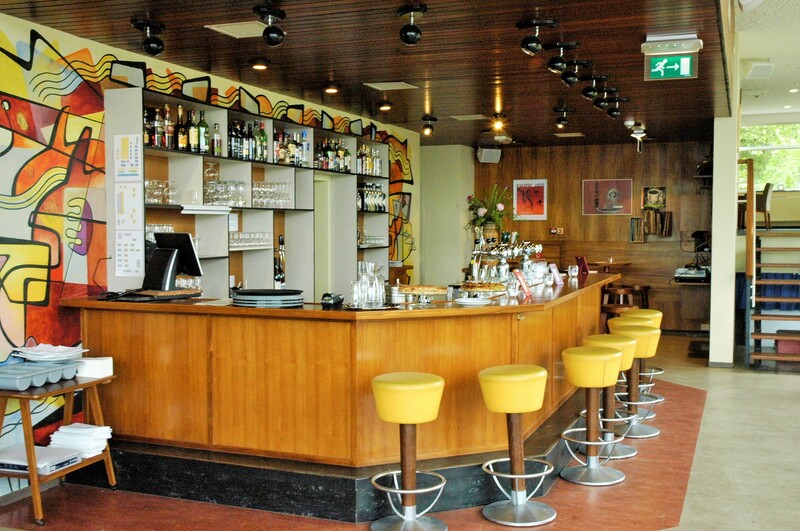 But most of it is connected to the taps of Homelands bar, pleasant hangout where they made more than the most of assembled retro furniture. Culinary reviews are positive and when the sun shines things get even better as Homelands terrace stretches right until the waterside. From there you can spot, in between the replica of a seventeenth century ship and the iconic NEMO building, Amsterdams centre. You know it is busy out there, but at Homeland it all feels very far away. Why are we telling you all this? 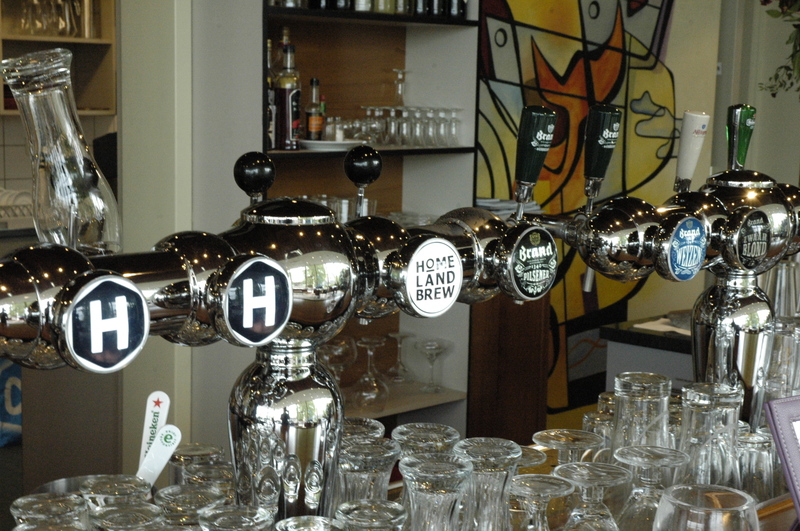 Because Homeland makes for a perfect pit stop in between Amsterdams central station and our very own brewery. The opening of this maritime territory created a very appealing new route towards the eastern part of town. From central station, turn left towards the public library, cross over to the bright parasols of Hanneke’s Boom after you passed it and enter the marine terrain by the bridge to the right a little further down the road. It will feel like foreign ground but all you need to do from there is spot the cubicle shape of Pension Homeland. All of this will take no more than twenty minutes. Great time for a break with a beer at this historical site, before you head towards that giant windmill for more. That’s just fifteen minutes. One comment on "Homeland: brewing for Amsterdams historical marine site"